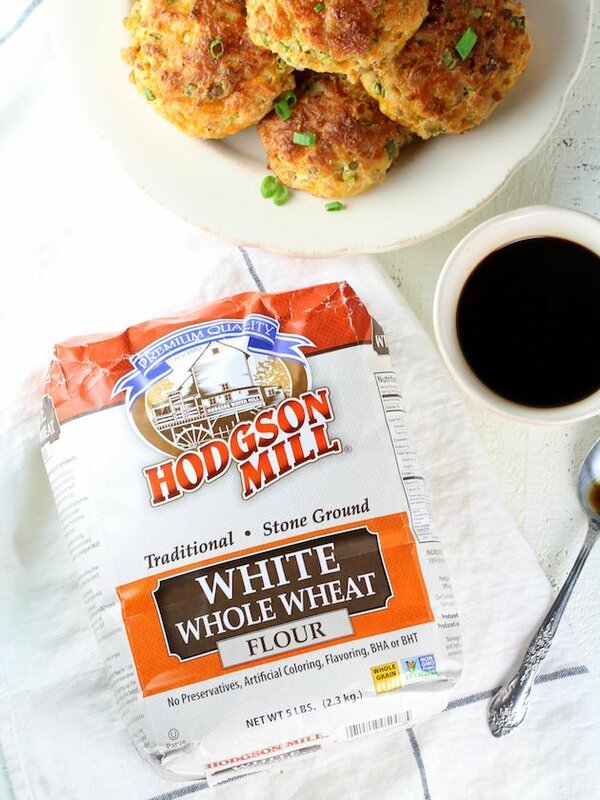 Thanks to our friends at Healthy Aperture Blogger Network and Hodgson Mill for sponsoring these Savory Turkey Sausage Buttermilk Biscuits! 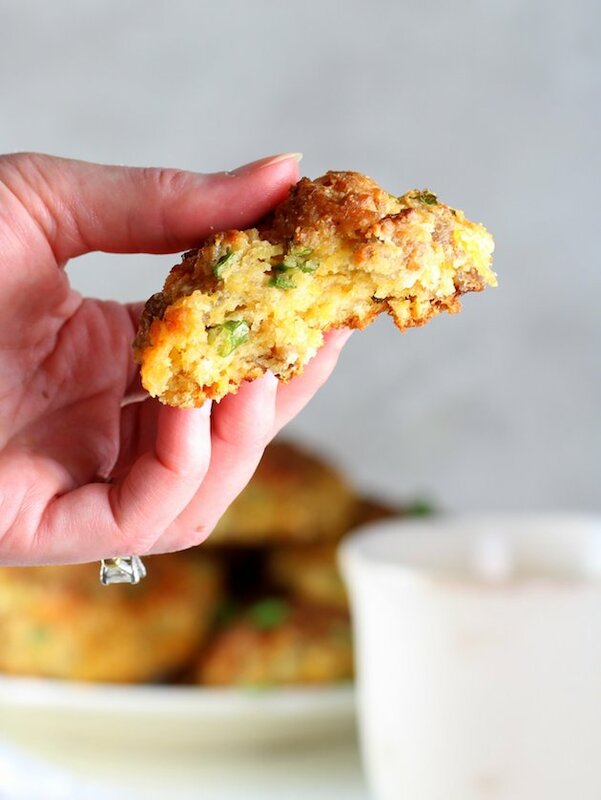 These soulful, golden biscuits of goodness are a heart-healthy, all-in-one breakfast! 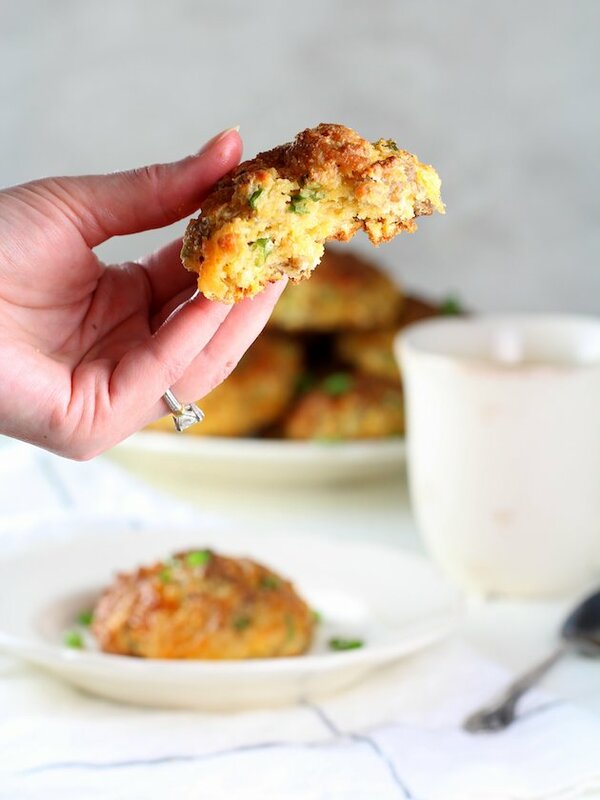 Make and bake and enjoy these breakfast bombs all week! As you probably already know February is American Heart Month. And for good reason: Heart disease is the leading cause of death for both men and women in the United States. The good news? It is also one of the most preventable diseases. Don’t smoke. Smoking is the leading cause of preventable death in the United States. If you don’t smoke, don’t start. Actively manage your health conditions. Work with your health provider to manage high blood pressure and high cholesterol… and if you’re on prescription meds for that, take them! Stay active: we should be actively moving for at least 2 ½ hours per week. Even short 10-minute walks help! Finally, make heart-healthy eating changes: eat food low in trans-fat, saturated fat, added sugar and sodium… and make sure you get that daily fiber! That’s exactly what we’re talking about today… making healthy eating changes by baking with whole grains! Fiber is one of those important nutrients no one gets enough of, but can make a huge difference in so many ways – it can help promote heart health, as well as your digestive health. That’s a win-win my friend! If you’re not used to baking with whole grains, I’m here to help. 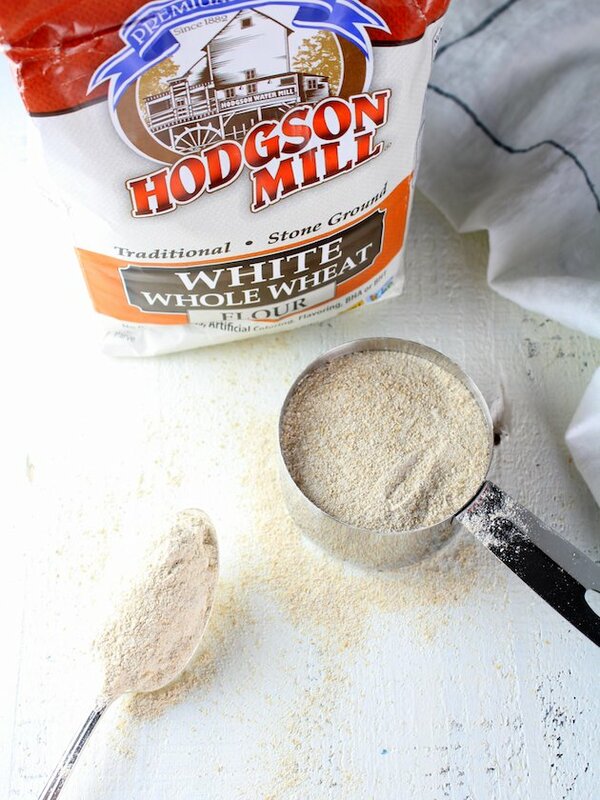 Hodgson Mill offers a wide range of premium quality flours. They choose premium wheat, oats, rye, and corn of the highest grade, from the U.S.A. They clean it twice before grinding, removing the chaff and broken kernels. Only the plumpest, ripest grain berries make it through. Then they mill the grains gently and carefully between two millstones, cut and shaped from genuine North Carolina red granite. This premium milling process, which remains cooler than other methods, ensures that the grain’s nutritious germ, bran and natural oils are fully preserved. What’s not to love about all of that!?? You can easily swap out their Whole Wheat Graham Flour, White Whole Wheat Flour, or Oat Flour for all-purpose flour as an easy way to add nutrition when you bake. 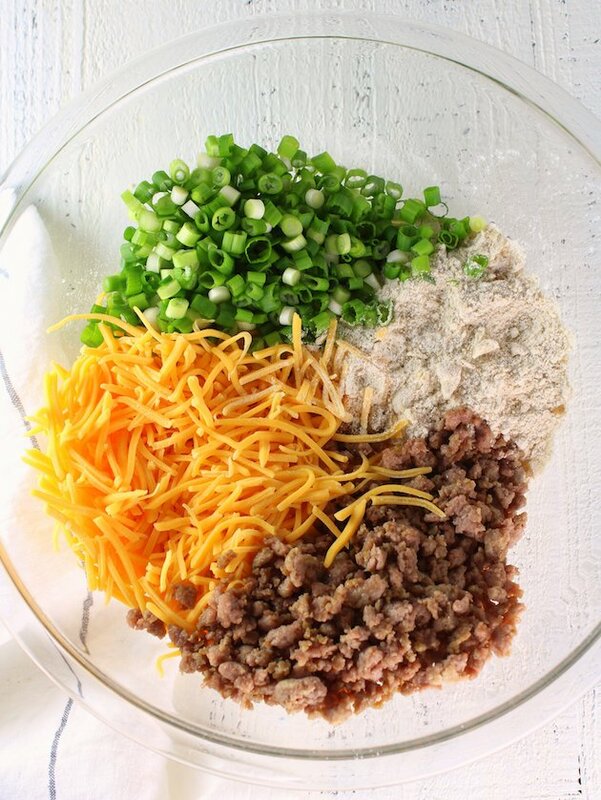 I recommend you start by substituting 1/4 – 1/3 of the total flour in a recipe with whole grain flour – you probably won’t even notice, but you still get the whole grain benefits! 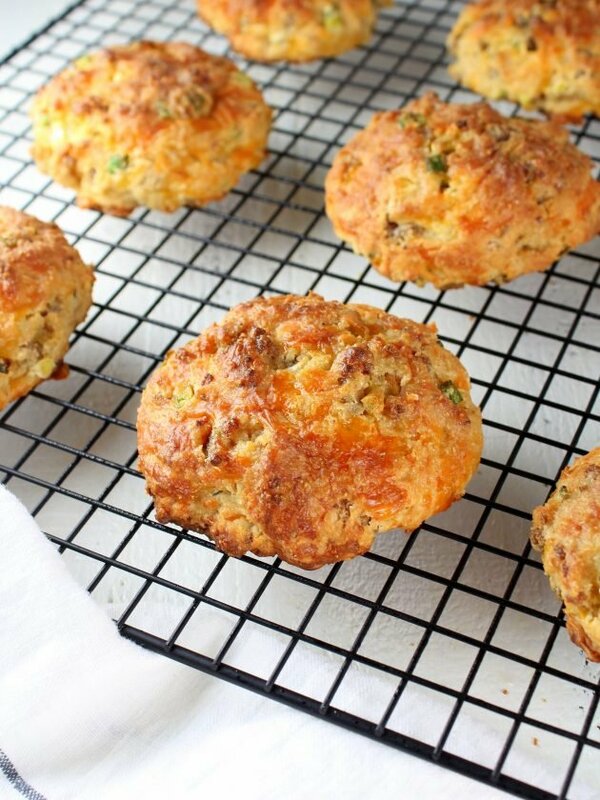 They are hearty and cheesy and meaty and full of all kinds of healthy White Whole Wheat Flour! One cup to be exact. I blended that with 1 cup of unbleached flour to create the tastiest golden breakfast biscuits a girl could want. 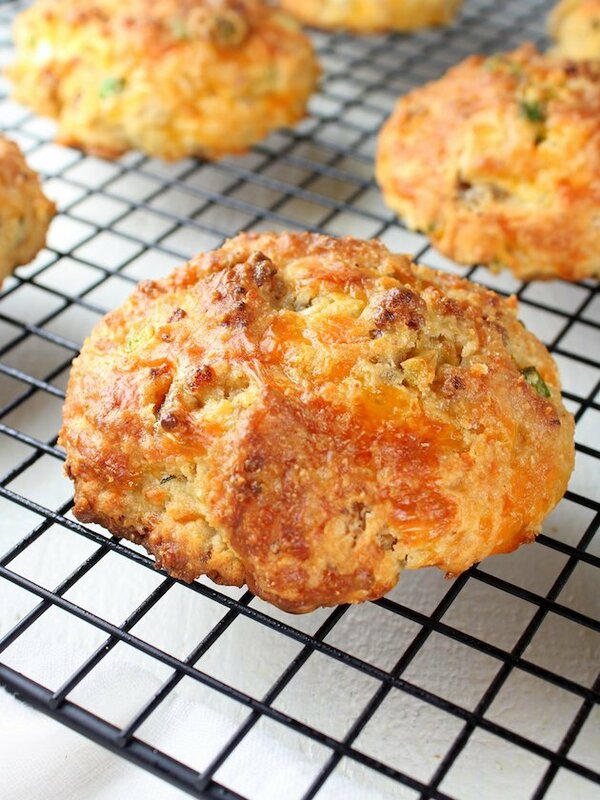 No kidding people – these biscuits bake up tender and flaky. 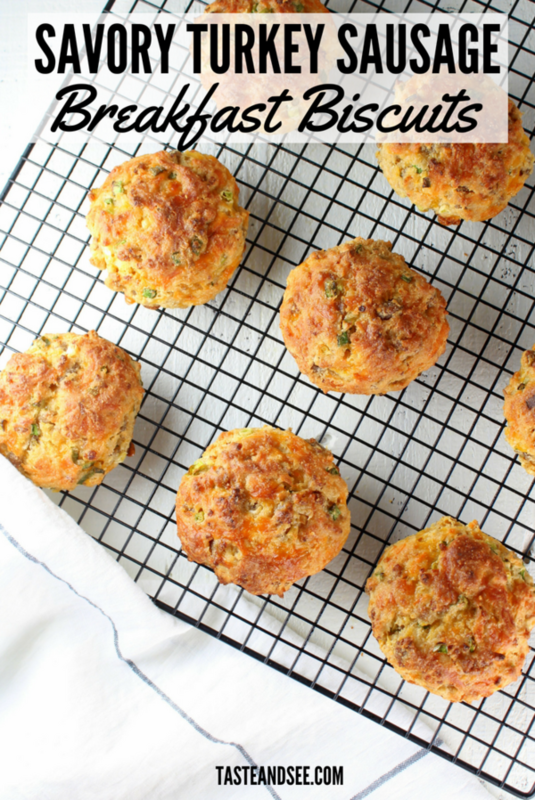 And they’re jam-packed with green onions, turkey sausage, tangy buttermilk, and cheddar cheese. Droooling! 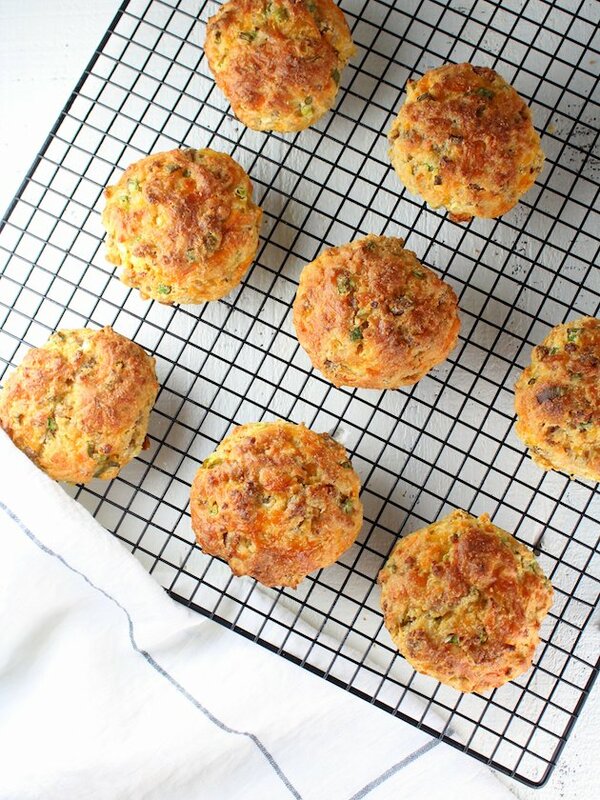 And not only are they scrumptious, they are super-easy to make. Bake up a batch and voila! Breakfast for the entire week. Start off by preheating your oven to 425 degrees. 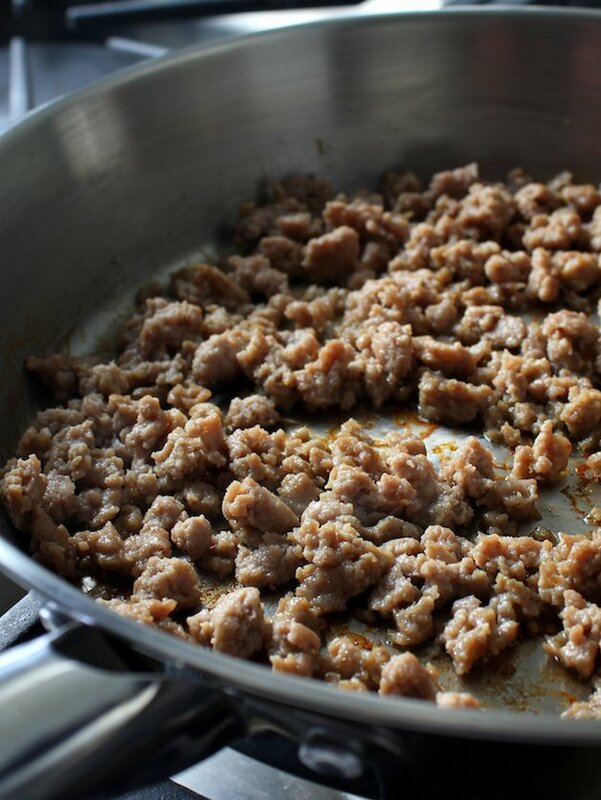 Then sauté the turkey breakfast sausage with a little olive oil and garlic powder in a skillet over medium high heat (I found the turkey breakfast sausage in the freezer area with the meat products). Next, mix your flour, baking soda, baking powder and salt together. Then use your hands or a food processor to work the butter into the flour until it’s broken up into little crumbs. 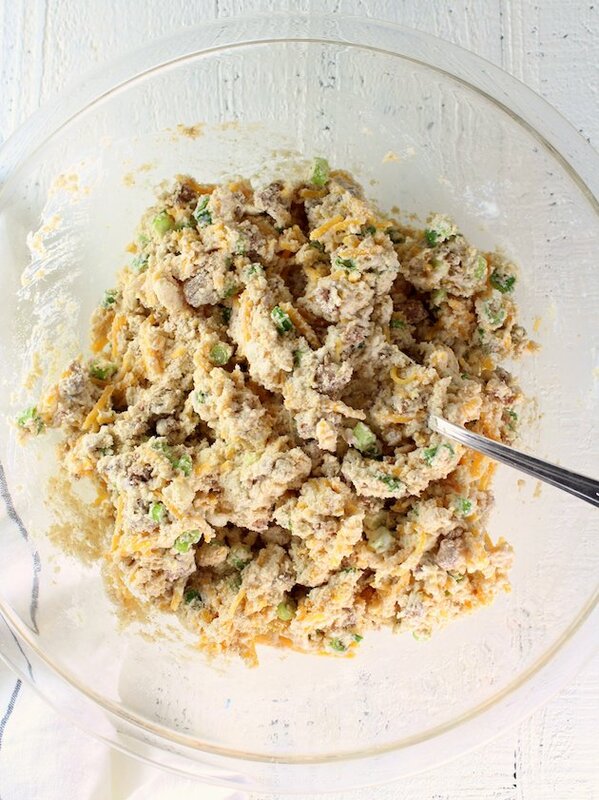 Next, add your cheese, chives and cooked sausage and mix it all together. Finally, pour in your buttermilk and mix well. Now form little round discs out of the dough – I made 10 four ounce balls. Place them on a parchment-lined baking sheet and bake for 20-22 minutes. Then behold your hearty, flaky, savory discs of golden morning goodness! 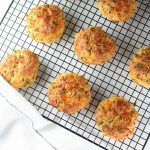 These Turkey Sausage Buttermilk Biscuits are a great way to introduce some more healthy whole grains into your diet, and meal prep breakfast for the week! 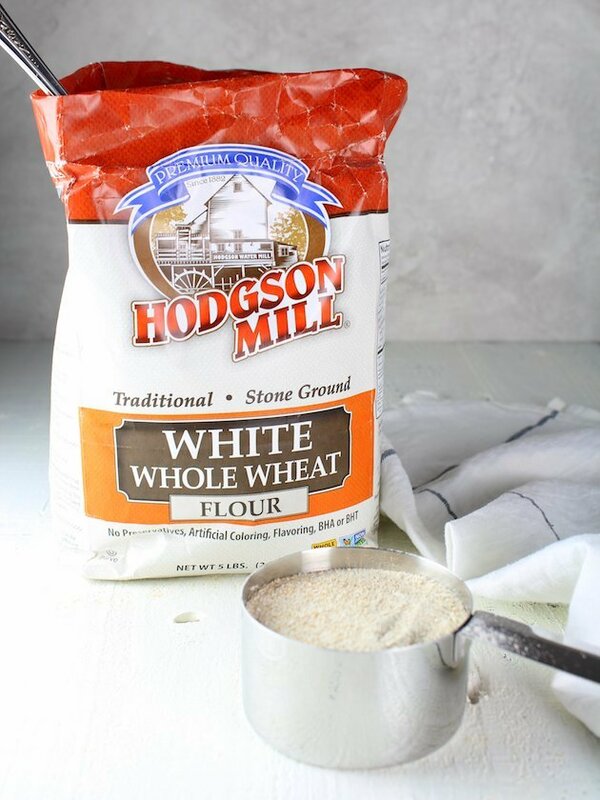 PS: If you’re eating gluten-free, good news: Hodgson Mill has you covered! They offer Quinoa Flour, Almond Flour, Coconut Flour, and Rice Flour. *If you use a different sausage (like pork sausage) that has a higher fat content, you should drain off any excess fat after cooking it. *I found the turkey breakfast sausage in the frozen meat area of the grocery store. Yay! I love hearing that! Thank you, Shawnna! These sound great. May these be made in advance so all I have to do is pop them in the oven? Or may they be reheated if made in advance? Thank you. Hi Elizabeth, thanks so much! I think you could do this one of two ways… make and bake them and then store them in an air tight container in the fridge (up to 3 days), reheat in a 400 degree oven for about 6-8 minutes. Or you could freeze and bake them later.. After you form the dough mixture into discs – don’t bake but wrap and freeze them in a freezer ziplock or airtight container. Then when you’re ready to bake them, unwrap and place the biscuits on a baking sheet, and bake in a (preheated) 425°F oven for 35 to 40 minutes. Hope that helps!